RAND(Squawk): The gods of Google are fickle and don't look at what you expect. The gods of Google are fickle and don't look at what you expect. I write this blog as a place to push out ideas, describe topics that interest me and practice writing skills. There is little danger of finding fame and fortune from a random collection of posts with little topic focus and absolutely no publishing schedule. 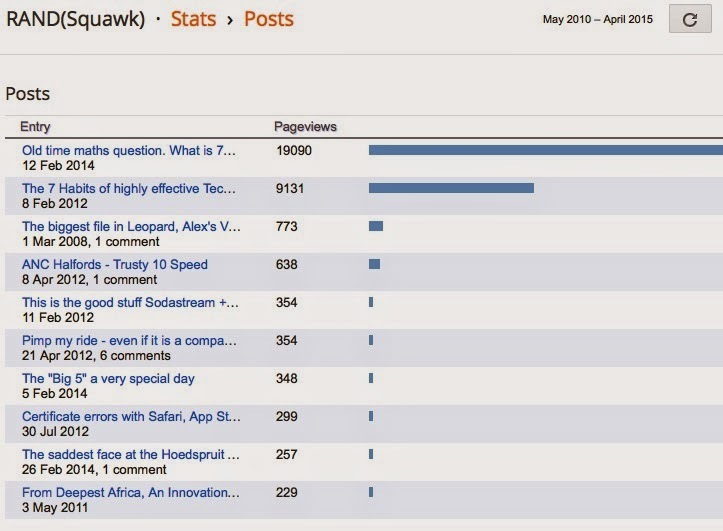 "Art is nothing without an audience" and for a blog that means looking at the viewing stats provided by Google. Generally this is low traffic blog with a few 10s of views on most entries, and a couple 100s of hits on the more popular entries. Up to the start of this year the most popular entry was "The seven habits of successful technical support." with almost a 5000 views. The the start of a new career, fame at last ? Sorry no all the searches leading to the page were looking for the colourful 7 logo. Last month the blog viewing stats suddenly went through the roof with over 1000 hits a day. All the traffic was going to a Feb 2014 entry based round a picture of a maths question that had previously been circulating on Facebook. The blog has some added value describing the maths behind the question and adding some humour on the end. I was surprisingly pleased by the number of page hits and even added an advert for my sisters new book on the end of the entry. The joy did not last long and the stats tailed off quickly. 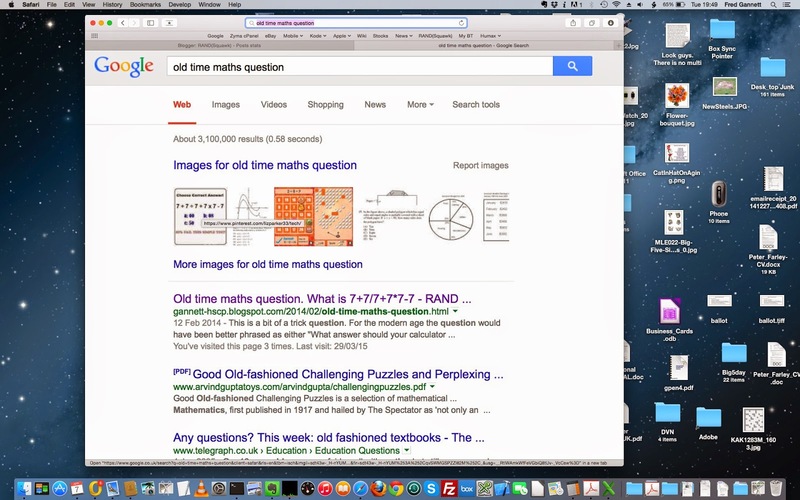 A recent search for "old time maths question" shows why. The image and the article are still at the top hit but the image link goes to a Pinterest page. 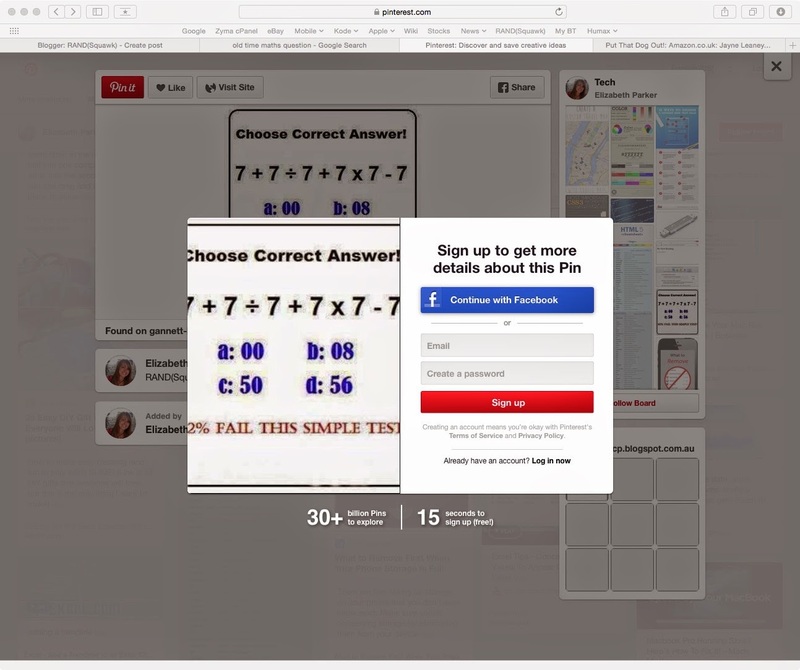 No added value on that Pinterest page, it just redirects back to my blog entry. However the traffic is stolen and the link to the blog is lost behind a sign-up click wall. What I learnt from this, make an eye catching image and don't rely on great content to find traffic. There is little sense of time in search with derivative works valued as much as original content.